We recently caught up with CofC Honors alum Ariel Benton ’18 who lives in St. Petersburg, FL and works for Raymond James as an analyst in their Accelerated Development Program (ADP). A South Carolina native, Ariel earned a B.S. in Finance and a minor in History. As a student, Ariel served as the Operations Manager and European Economist for the School of Business Investment Program. 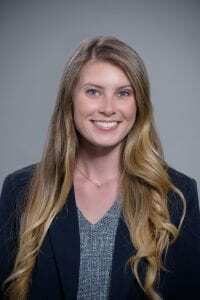 She completed internships at Oak Capital Management and Lakeview Capital Partners and worked as an assistant in the College’s Department of Economics and with the Office of Economic Analysis. Ariel also co-authored a publication with two CofC faculty in the Journal of Trading. Tell me a little bit about your background and how you ended up at CofC. Ariel Benton ’18 graduated in May and now works as an analyst for Raymond James in the Accelerated Development Program. I was drawn to the College of Charleston primarily for its Honors College, where I knew I’d have access to a unique set of courses with rigorous, interdisciplinary curriculum and an additional level of support I wouldn’t receive at most public universities. The Honors College requires that you fully immerse yourself in your education and that immersive experience was what I wanted out of college. While the primary reason I chose CofC was for its academics, I’d be lying if I said the city itself didn’t play a role in my decision. Having the opportunity to pursue an Honors education in the city that I knew and loved was an opportunity I couldn’t pass up. What drew you to finance as a career path? Did you know that you wanted to pursue a finance major when you came to CofC? e in the business school and it was in a microeconomics class as a sophomore, that I discovered an entirely new interest of mine. Over the course of that semester, I explored other opportunities in the School of Business and eventually found the finance major. For me, finance was the intersection of all the things I really enjoyed—math, history, economics, and policy, among others, and I was surprised by the marriage of the quantitative and the qualitative in the discipline. I was also surprised by the variety of career paths within finance. How did you identify your Bachelor’s Essay advisor and determine your research focus? The School of Business Investment Program’s mission is to provide career-oriented application of theoretical knowledge learned in the classroom through analytical asset valuation, portfolio management, and group collaboration. My Bachelor’s Essay advisor was Dr. Mark Pyles in the Finance department. Dr. Pyles was my major advisor, one of my favorite professors in college, and my biggest mentor throughout my undergraduate career. I got to know him really well through both my major classes and the School of Business Investment Program, of which he serves as the Director. Having developed that mentor/mentee relationship throughout my sophomore and junior years, working with Dr. Pyles as my Bachelor’s Essay advisor seemed the most natural choice. In deciding on a research focus, I knew I wanted to study a topic that had real relevance in terms of social and political issues. I became passionate about the gender gap early on in my major. You’d have to actively try to not notice that the finance industry is still a heavily male-dominated one. A real disparity exists between men and women, especially in terms of senior management and advancement in the corporate world. This isn’t unique to the finance industry, however—it’s been documented in corporations across industries. We ultimately decided to study the gender gap in the finance industry with respect to state political affiliation in past presidential elections to determine if there was any sort of relationship between the two. We chose this topic because we found evidence of a growing “partisan schism” in the U.S. on issues concerning gender equality. We identified each states’ vote in every presidential election since 1992, noting which were always “blue”, always “red”, and “mixed”, and then attempted to see if there was a relationship between the state political leaning and compensation of executives employed over the same period in financial firms headquartered in that state. What conclusions were you able to draw from your Bachelor’s Essay research? As expected, we found that male executives have higher total compensation than female executives, with the gap existing in the bonus structure rather than base salary – but this wasn’t consistent when political affiliations were analyzed. Given the fact that the majority of financial firms are headquartered in states that are historically “blue” there could have been a sample size issue at play. In addition to the sample size issue, we did not analyze other factors that have been documented as having an impact on pay: including women taking time off from work for family or child-related purposes, for example, that may have led to different conclusions. Reflecting back on your Bachelor’s Essay now that you are in the workforce, have you gained any new perspectives or made new observations? The Bachelor’s Essay process taught me how to think creatively in terms of designing a research project and to take ownership of my work from start to finish. I think both of these skills are critical for almost any career, no matter the industry. Speaking to my Bachelor’s Essay topic specifically—despite examining the gender gap in the very industry I was entering to work, it was extremely encouraging to learn about Raymond James’ Diversity and Inclusion Department, and its various programs designed specifically to support the professional development of female associates at the firm. Closing the gap appears to be a big initiative across the industry. While it doesn’t detract from the fact that the gap still exists, it is certainly a step in the right direction for firms to advocate for and offer solutions to narrow and eliminate that gap. How did you identify your current position at Raymond James? 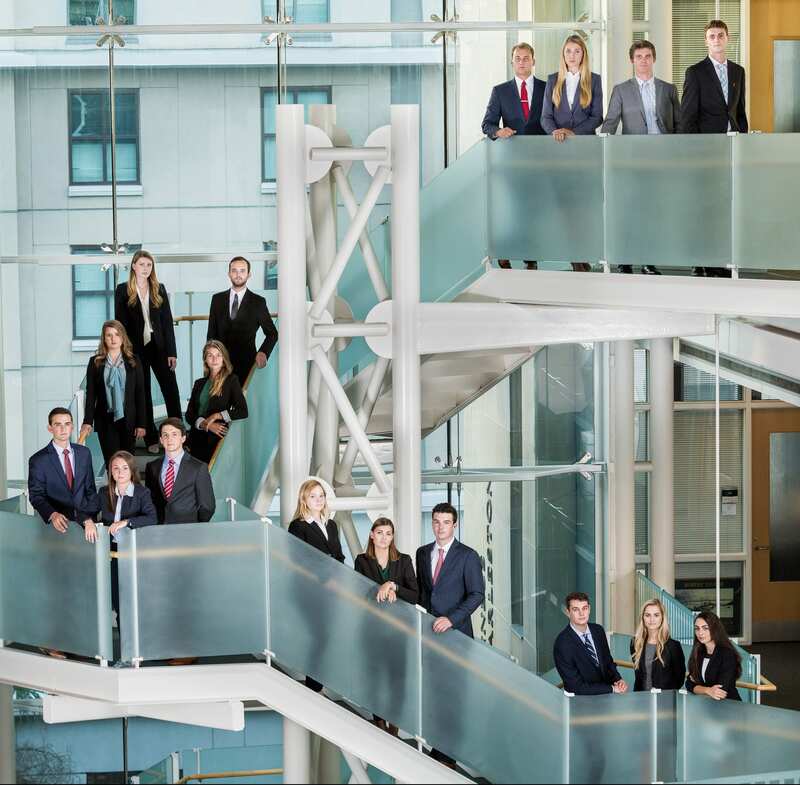 The School of Business Investment Program hosts a series of “firm days” throughout the year, where students are invited to network with visiting professionals from various prominent financial firms. Past firms in attendance have included Raymond James, Goldman Sachs, and Lincoln Financial Group—to name a few. While the firm visits are designed specifically for the Investment Program, there is always an open general student presentation where any students interested in finance-oriented careers get the opportunity to hear directly from the visiting professionals about internship and full-time opportunities within their firm. 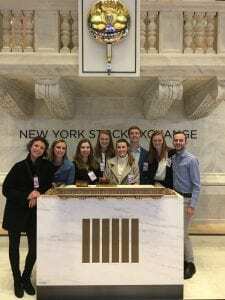 Ariel and other members of the School of Business Investment Program at the New York Stock Exchange. 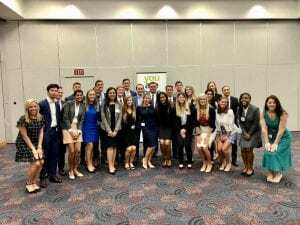 Members of the Campus Recruiting team at Raymond James and other associates of the firm attended the “Raymond James Day” on campus last August. I was able to hear directly from the recruiting team about upcoming opportunities and was especially drawn to the Accelerated Development Program (ADP) because of its rotational nature. The presentation offered insight into the application and interview process, as well as the opportunity to network with key members of the recruiting team. What does it mean to be a part of the Accelerated Development Program (ADP) at Raymond James? The Accelerated Development Program is a 6- to 19-month rotational program (depending on the track) designed for top college graduates where analysts rotate through a variety of departments within their chosen “track”. There are currently 3 major tracks: Finance, IT, and Marketing—with multiple focus areas within each. ADP allows analysts to gain exposure to core business units while developing their professional and leadership skills, as well as general knowledge of the firm and the industry. ADP Analysts have frequent exposure to senior leaders across the firm and an extensive support system of their program manager, rotation managers, and mentors. The program’s ultimate goal is to place analysts into a permanent full-time role within their track at the completion of the program. ADP is an excellent way to find your fit within the firm, develop your skill set, and “fast-track” your career. I am personally on the Investment Research, Consulting, and Wealth Management track within the broader Finance track. What experiences at the College stand out as having prepared you for your career? 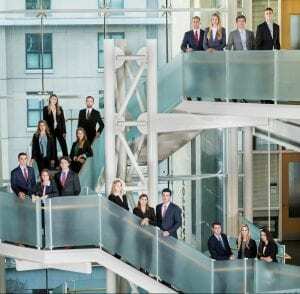 Of all my experiences at the College, I would say that my involvement with the School of Business Investment Program most prepared me to begin my career. The Program allowed me to practically apply the knowledge I learned in the classroom by managing an investment portfolio but also challenged me to step outside of my comfort zone and develop my professional and leadership profile. I can never thank the Program, Dr. Pyles, Dr. Huerta, or the School of Business enough for all they did for me. Ariel and other members of the Accelerated Development Program at Raymond James. Aside from the Investment Program, another experience that stands out to me is the undergraduate research component of the Honors College curriculum. From day one, CofC Honors students are encouraged to develop relationships with professors and seek out research opportunities. In addition to the required Bachelor’s Essay, I had the opportunity to assist Dr. Pyles and Dr. Huerta with research that was ultimately published in the Journal of Trading last winter. This experience was incredibly rewarding, both in the sense of knowledge gained about what all goes into the research process, but also having the chance to study something I had an active participation in – analyzing the impacts of market conditions on voting decisions in the School of Business Student Investment Fund. It is an experience I will forever be grateful for. Furthermore, the Bachelor’s Essay allowed me to hone my research and analytical skills while learning to navigate the waters of independent scholarship. That level of independence integrated into the Bachelor’s Essay process is especially important as students prepare to make the transition from college to a full-time role. What advice would you offer students interested in pursuing a career opportunity similar to yours? See what is out there! Any time you hear of a firm visiting campus or a networking event within the business school, go! The School of Business puts a great deal of work in connecting students with industry professionals. Take advantage of the opportunity to interact in person. You’d be surprised by the different career opportunities out there and you never know where a conversation could take you.